We examine the race records of more than 43,852 runners from the 2017 Berlin Marathon. Who were the participants from this year’s race? Where were they from? How old were they? Was ot their first marathon or had they run before? We also examine how gender, age, experience, and ability influence performance (finish-times, pacing, hitting the wall) at this year’s 44th anniversary event. This year Berlin hosted a record of 43,852 marathon runners from 137 countries as the Berlin Marathon celebrated its 44th anniversary. Eliud Kipchoge confirmed his position as the world’s best marathon runner with a dramatic win, with a time of 2:03:32. Despite the humidity and the rain the Kenyan came from behind to steal the day. Meanwhile, Gladys Cherono won the women’s race in a world-class time of 2:20:23 even after suffering in the final stages. But what about the other 43,850 runners? How did they get on? What follows is an analysis of the data generated by Berlin’s dedicated runners as they ran, jogged, and walked their way through this European capital’s crowd-lined streets. The data available for this includes 5km split-times, as well as gender and age information. In addition, separate data that we have collected over the years (>2.5m race-records from more than 100 marathons) makes it feasible to match runners across multiple races to identify whether a particular runner is a new marathoner (first-timer) or a regular racer (repeater). This means that we can consider how gender, age, ability, and experience come to influence how race day unfolded for Berlin’s runners this year. This year 43,852 runners took part in the Berlin marathon, but with just over 70% male, Berlin still has some ground to make up when it comes to attracting the level of female participation that is increasingly common at big city marathons; for example, London this year attracted 40% females, while Chicago attracted almost 50% females only a few weeks ago. Nevertheless Berlin continues to rank as one of the largest (and fastest) marathons, and this year it hosted runners from 137 countries, with Great Britain, USA, and Denmark topping the participant table (excluding Germany), each providing more than 1,500 runners to the field; it is interesting to note, given the strong female particpation levels in Chicago, how the USA, and Canada, stand out in Berlin by contributing equal numbers of men and women. The race-data from Berlin does not provide exact ages for runners, opting instead to include the standard marathon age categories, and the graph below shows the relative proportion of male and female runners at Berlin this year, across the various age groups. Like many modern marathons, a greater proportion of female runners tend to be from the younger age groups (18–34), compared to men. 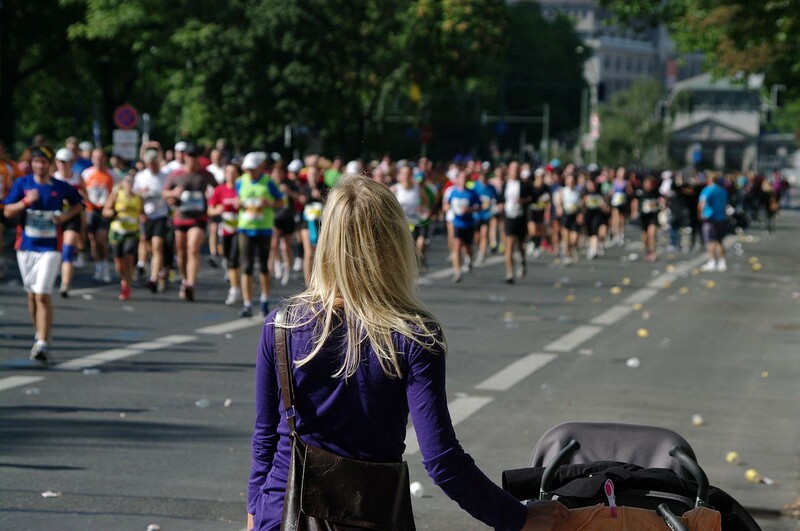 For example, in Berlin 30% of female runners were in this 18–34 age group, compared to just 20% of male runners. But, as is often the case at similar races, the particpation level of older women tends to deline and a greater propotion of older runners are male. We can also divide runners up in to those who appear to be completing their first marathon (first-timers) and those that have completed multiple marathons (repeaters). Strictly speaking, our ability to identify first-timers and repeaters is limited to the runners in our larger dataset of >2.5m marathon race-records. If we have no previous record for a runner then they are considered to be a first-timer. Otherwise, they are a repeater. This is imperfect, because the larger data-set is obviously incomplete — some runners will have raced in marathons that are missing from it–– so we will tend to over-estimate the number of first-timers and under-estimate repeaters, but it should be good enough for the trend analysis that follows. In Berlin this year, a majority (60–70%) of younger runners (<40 years old) were first-time marathoners, at least by our definition; females are more likely to be first-timers than males across all ages. As might be expected this percentage decreases predictably with increasing age but it is encouraging to still see plenty of (apparent) first-timers starting later in life. For example, more than 20% of runners in their 60’s appear to be first-time runners. For repeaters, the number of marathons completed increases steadily with age: a typical 35–39 year-old in Berlin this year was running their 3rd marathon; a 50–54 year-old male runner was probably on their 5th; while a 50–54 year-old female was running their 4th marathon, on average. Now that we have a sense of who the runners are, and their experience levels, let’s take a look at their performance. The chart below shows the number of male (blue, above the line) and female (red, below the line) runners who finished at various finish-times; the height of each bar corresponds to the number of runners cross the line at that time. There is no doubt about it, Berlin is a fast marathon. Obviously there are very few finishers crossing the line for the fastest finish-times (shortly after 120 minutes) with a sharp increases in finishers from about 180 minutes onwards, for men and women. The most popular finish-time, for men and women, is 240 minutes, and we can see large spikes of finishers for this landmark time. Other landmark times are also easy to identify with finisher-spikes corresponding to 180 and 210 minutes too (for me) as well as smaller spikes for intermediate times. The vast majority of men and women have crossed the line by the 6-hour mark, making Berlin one of the fastest big-city marathons. As we might expect age has a significant influence on average finish-times. The the chart below shows that when we get older we also get slower, but only after our mid- to late-30s. For example, on average the fastest finish-time for men occurs for the 35–39 year-old group, but men and women both slow in their 40s, 50s, and 60s. Experience helps, somewhat, especially for younger runners. 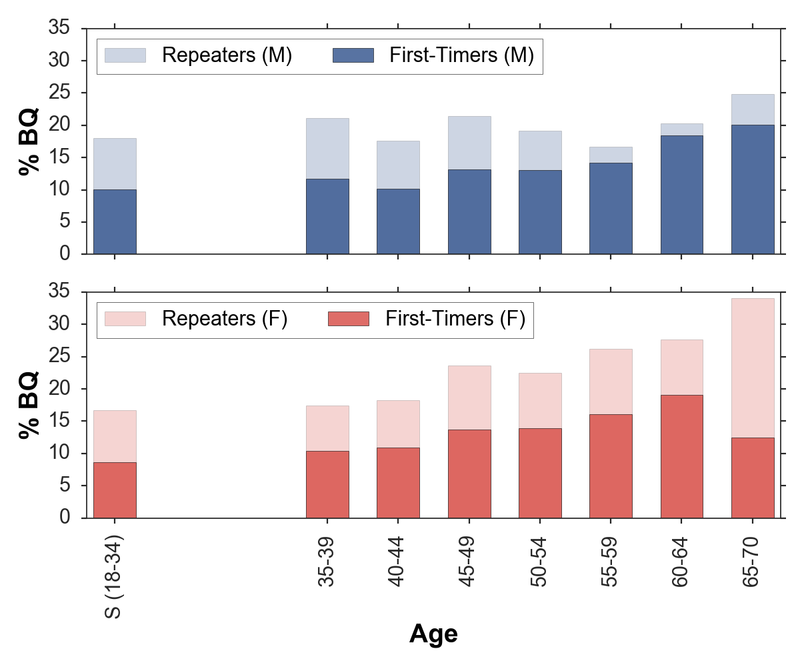 When we compare the average finish-times of first-timers versus repeat runners, above, we see the same pattern with age, but with first-timers significantly slower than repeaters across all ages. For example, male first-timers in the 35–39 year-old group have an average finish-time of just over 240 minutes in Berlin, compared with less than 230 minutes for males of the same age who are repeat runners, running their 3rd marathon. The same holds for women and this experience dividend persists across all ages, albeit to a diminishing degree among older males. It‘s not all bad news for older runners. Clearly age and experience are connected, since older runners are less likely to be first-timers and have tended to run more marathons. To better understand the relationship between age, experience, and finish-time we can consider an age-independent measure of finish-time, which allows us to compare the finish-times of runners across different age ranges. One way to do this is to use the famous Boston Qualifier (BQ) times. These are gender-based and age-based finish-times which runners need to satisfy in order to be eligible to qualify for the Boston Marathon. For example, at the time of writing (October 2017) male runners in the 35–39 years old age bracket need to finish no later than 3 hours and 10 minutes (190 minutes) to be eligible for qualification. For similarly aged women the qualification time is 220 minutes. Using these BQ thresholds we can evaluate how runners in different age-groups are performing, relatively to one another, by calculating the percentage of runners achieving their BQ time within these groups; the BQ rate. In the bar charts above we plot these BQ rates for men and women, separating first-timers from repeaters, to get a sense of how experience helps. It helps a lot: for men and women, the BQ rate for those with repeat marathons is significantly better than the BQ rates for first-timers, across all age groups. But getting older also tends to help, even for first-timers, at least for women, where we see BQ rates increasing with age for first-timers and repeaters. Since we have access to 5km split-times, we can also look at the average pace for men and women across each of the 5km segments, to get a sense of how the race unfolded for runners on the day. To make it easier to compare runners with different finish-times, it is more natural to look at relative paces for these segments; each relative pace (RP) denotes the degree to which the runner is running faster or slower than their average race-pace. For example, a relative pace of 0.9 for the first 5km means that the runner has run this segment 10% faster than their average pace (for the race as a whole). In general, male and female runners adopt broadly similar pacing strategies, with women pacing a little more evenly than men on average. The first 5k segment tends to be the fastest (RP = 0.95) with runners starting off about 5% faster than their average pace, and then gradually slowing until the short (2.2km) final segment, when runners manage to speed-up somewhat. While men and women both start fast, women tend to moderate their early pacing more efficiently than men. As a result they slow down less than men during the latter stages of the race, and they speed-up more for the final segment. For men and women the 35–40k segment tends to their slowest of the race and, along with the fast first segment, this means a relative pacing range for men from 0.95 to 1.1 and for women from 0.95 to 06. This pacing profile is not unusual, certainly for relative flat courses, but the range is narrower than os found for similar races such as Chicago. In Chicago this year runners started off, on average, about 10% faster than their mean race-pace and slowed by up to 20% for the 35–40k segment. When we look at the pacing of runners who achieve a BQ time (by definition, those runners who fast for their age) we see a more even pacing profile. BQ runners still tend to start fast, but only about 2% faster than their mean race pace, and they still finish more slowly, but not as slowly as regular runners; overall the pacing range for BQ runners is only about 6–8% compared to 11–15% for typical runners. For most runners then, the Berlin marathon is a race of two halves, a fast first-half, followed by a slower second. The relative difference between the first and second half is commonly used as an indicator of pacing discipline. A relative split of 0.1 (a positive split) means that the first half is 10% faster than the second, while a relative split of -0.1 (a negative split) means that the first half is 10% slower than the second. As the graph below shows, approximately 12–14% of Berlin runners manage a negative split (relative split < 0), marginally more for women than for men. Although this may seem low it is actually a very high negative split rate, relative to other races. For example, this year in Chicago, only 5% of runners achieved a negative split, with no material difference between men and women. A larger difference exists between the genders when it comes to positive splits (relative split > 0). Men tend to run fewer, small positive splits (relative split < 0.15) and more large positive splits (relative splits > 0.15), compared to women. Large positive splits are likely to correspond to runners hitting the dreaded wall. For the purpose of this analysis we determine that a runner hits the wall if their relative split is greater than 0.33% in other words, they must slow by at least 33% in the second half of the race. In the graph above we compare how often men and women hit the wall, based on this 33% threshold, and by finish-time. There is a very significant difference between men and women, as we have seen in every big city marathoin we have analysed, from Athens to Washington. Men are significantly more likely to hit the wall than women across all finish-times. Generally speaking, the likelihood of hitting the wall increases with finish-time and peaks, for men at around 330 minutes; 10% of men finishing around this time hit the wall, compared to less than 2% of women. It is worth pointing out that these rates of hitting the wall are remarkably low, another feature of the Berlin field that speaks to ability and experience. For example, in Chicago this year, for similar finish-times there were more than 3-times as many men and women hitting the wall. The Berlin marathon is one of the largest, oldest, and fastest big-city marathons in the world. This year’s 44th anniversay event was no different with more than 40,000 runners from more than 130 countries racing Berlin’s crowd-lined streets. Every runner had their own personal goals to achieve but hopefully this analysis helps to shed to some light on how the event unfolded for these participants.